- Item will be delivered with handle NOT attached. (instruction Manual included) Easy to fit. The specially designed wheels of Panther Silent makes outdoor operations possible - without problems. Metallic chips, small stones and snow do not stick to the wheels, and the wheels are not blocked! At the same time the special wheels ensure a noiseless transport. The truck is therefore tailormade for every supermarket and every DIY store, wanting to ensure their customers a quiet and peaceful shopping atmosphere, whilst the employees transport different goods! The silent transport is also advantageous in buildings with both shops and living quarters. The wheels are gentle to the fine floor and flag stone layer, which is often used in customer areas. Panther Silent is therefore saving maintenance costs due to wear and damage to flooring, such as flagstones. 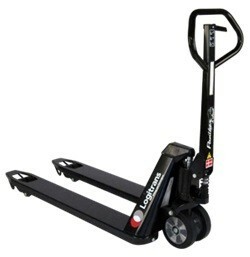 Panther Silent is a very environment friendly pallet truck with a long operating life!